I am introducing a new flavor starting immediately. Pina Colada! Non-alcoholic, of course! Turned out very delicious. I have added some photos in my gallery as well. For the first time, I made the announcement about my online bakery @ Balavihar, my Indian Sunday school. I also distributed a flyer after the speech. It was well received and I got a lot of support and appreciation. I have uploaded my speech/announcement below. CORDUSA has added this announcement on their Facebook page!! There is a link below. It was a pretty busy weekend with a catering order for Swamiji's birthday in BBNJ Balavihar. The order was for 120 mini cupcakes and a double layered sheet cake! I just made $135!! Can't wait to donate all of this money to CORD! You know there wasn't a single crumb left of everything I baked!! I have learnt a new technique to add decorations to the cake. Frozen buttercream transfer!!! I used it for Swamiji's birthday cake. Thank you Youtube!!! Today was my cousin Sahana's birthday. She is a gymnast and I used the frozen buttercream transfer technique to create Gymnast decoration. Check it out in the gallery! I need to learn other ways of decorating as well. LOL! I got to make 2 cakes for a dentist and a chess champion and an extra 24 red velvet cupcakes. They were a big hit, I heard that all the cake was gone, even the crumbs!! I hope you all like the cake! Happy Birthday Preethi and Pallavi! from everyone here at Frosted World. It was Thanksgiving today and my family and I spent the whole day in the kitchen. Which is our tradition. My part in the "show" was dessert, obviously. I was inspired to make warm butter cake with vanilla ice cream on top because, whenever my family and I go to California Pizza Kitchen we always order butter cake with ice cream. My cake was such a big hit. It tasted so good! It was like your taste buds were having a party in your mouth. Sadly, I have no picture and I will put it up as soon as I get it. I baked it 3 times over the weekend based on encore requests. Can you believe that?!!! I made black and white cupcakes today. For who? You may ask. Well the answer is clear, my piano teacher! HsinYi Tsai! She asked for cupcakes for her holiday party! I was really excited and she told me I was going to play too! She asked for pineapple cupcakes with coconut frosting, Yin Yang cupcakes, and Yang Yin cupcakes. They were a big hit and everyone liked them. In fact people asked me about it and if I would deliver to them in Highland Park, my answer, of course, was yes. Sorry Amma & Appa! You have to drive me around now. Today I had given my school teachers holiday cookies. I gave it to them during homeroom and by the time I went to their class almost a quarter of the cookies were gone. They loved them. I had also brought a tin of cookies with me for my friends, to share during lunch. Since we ate in homeroom, my entire homeroom wanted some when I opened the cookie tin during lunch. I gave it to everyone and they were all happy. As you explore my page, you will see there is no cookie page, that page is under construction and will be up shortly. 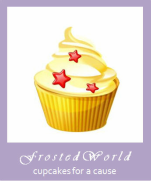 From now until December 26, 2013 I will be on break and Frosted World will be closed, unless you want to drive to Florida to pick up your cake or cupcakes! Harry Potter, here I come! You know how I make Cakes, Cupcakes, and Cookies, well now I made Focaccia bread with my mixer. It turned out awesome.